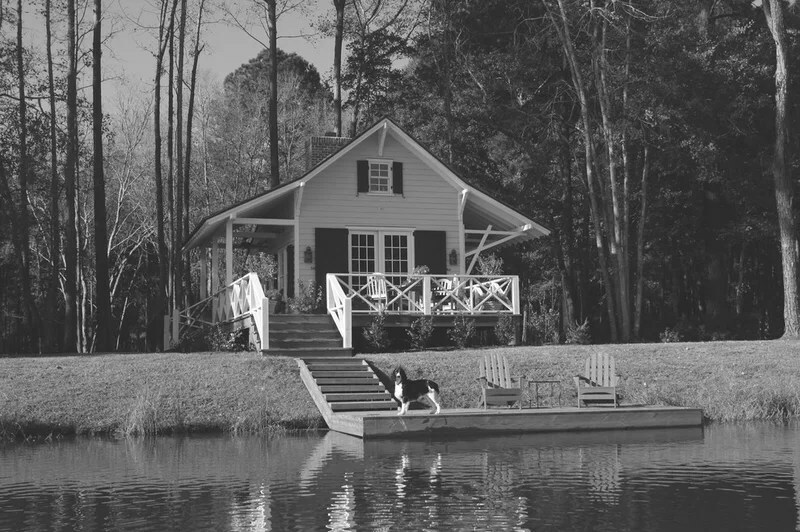 A couple and their two dogs get super casual in their boathouse, just a hop and a skip from their more formal main house. 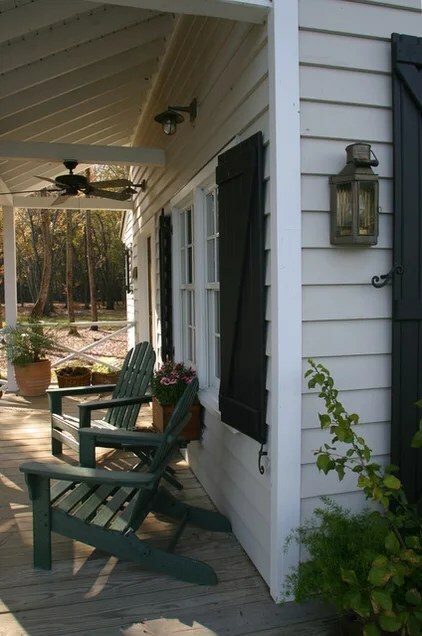 Located on The Ford Plantation outside Savannah, Georgia, the sweet, 600-square-foot outbuilding has architecture that’s a mix of Lowcountry style and efficient and beautiful sailboat design.Closer to the lake’s edge than the main house, the boathouse serves a handful of functions. 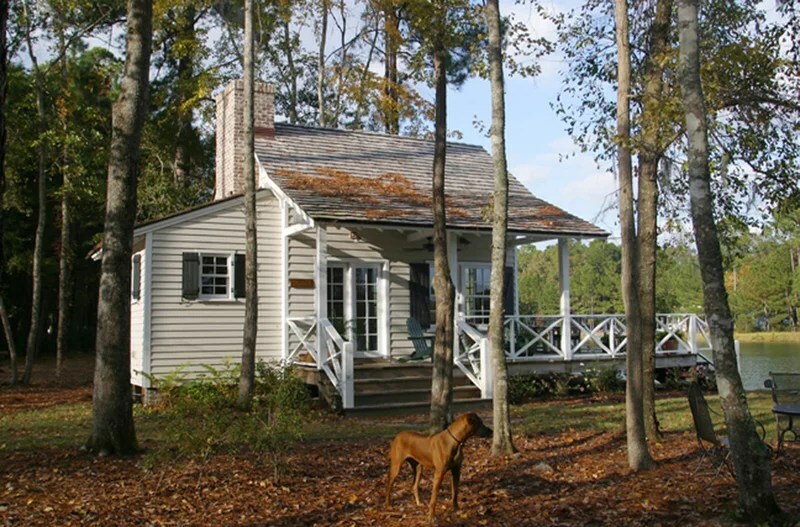 It is an office and a writing studio for one of the homeowners, a guesthouse they enjoy with extended family, a storage place for canoes and kayaks, and perhaps best, a place where the couple can relax together and with their dogs. 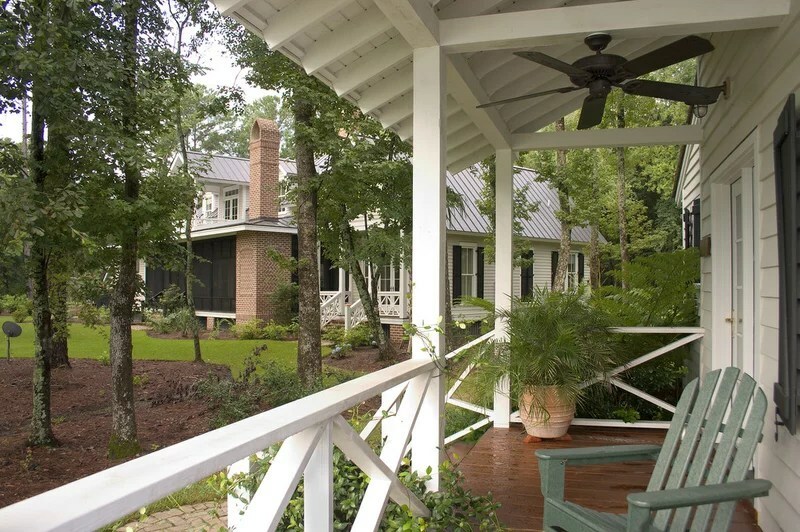 Architect Gerald Cowart designed the couple’s main house and used the same colors and materials here. 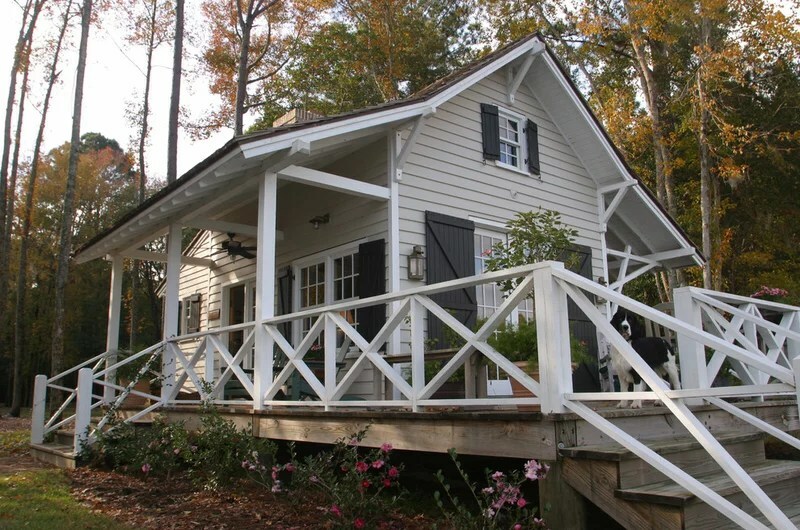 “The boathouse resembles the main house but is much more casual,” he says. 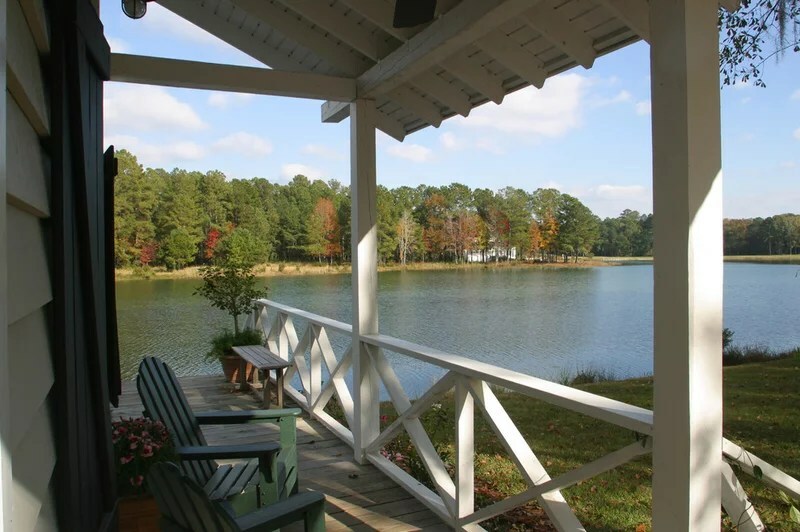 It’s closer to the water, and a dock provides another favorite spot for enjoying the water and fishing; they also launch canoes and kayaks from here. A double-pitched roof provides a covered porch for people on the left side, and a covered porch for boats on the other (there are brackets to hang them from). The board shutters have Z-bracing, and the railings have a simple X-bracing. “These railings are an inexpensive option and are very easy to build — they are just made of 2-by-4s,” Cowart says.The builders (from Tony Reardon Construction) also cut construction waste by using leftover materials from the main house, other projects and a supplier’s restock pile. The materials give the structure some charming quirks. 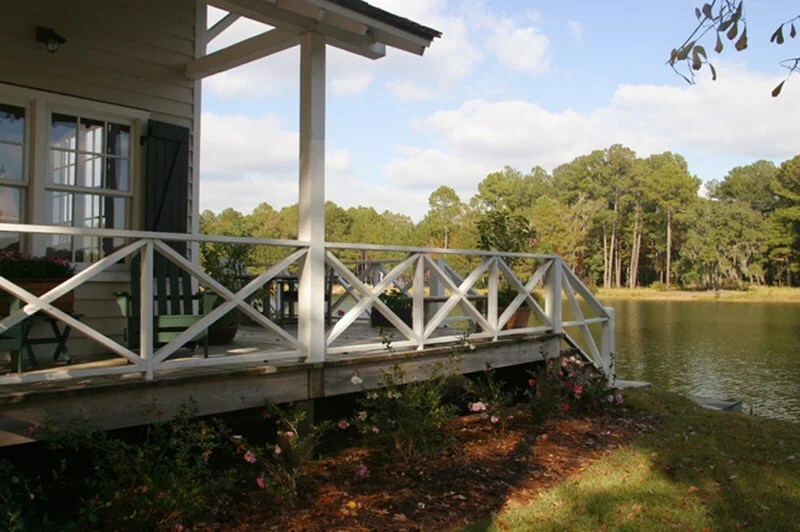 The deck’s pilings, for example, are made from the leftover pieces from the main house’s pilings. 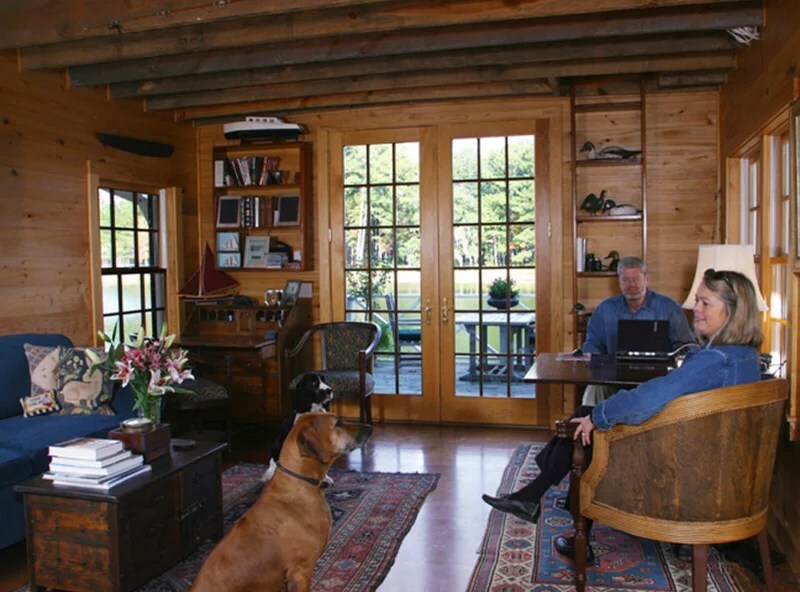 The main living room is a casual, kick-your-shoes-off kind of space, a favorite of the couple’s dogs. A decoy-filled ladder leads to an open sleeping loft for guests. The room also serves as a distraction-free office and writing studio.You may notice these French doors have more panes than the door in the previous photo. They were another money saver from a supplier’s restock pile. 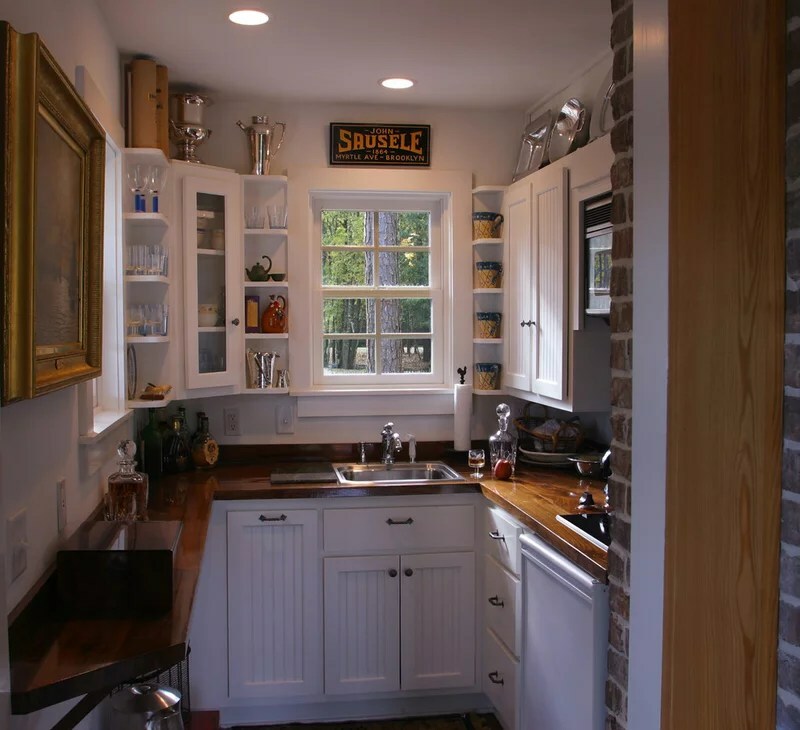 Much like with a sailboat cabin, the tiny kitchen’s design is very efficient. It includes a microwave, a dishwasher and a two-burner range. The countertops, made of reclaimed heart pine, shine like a boat’s teak deck. 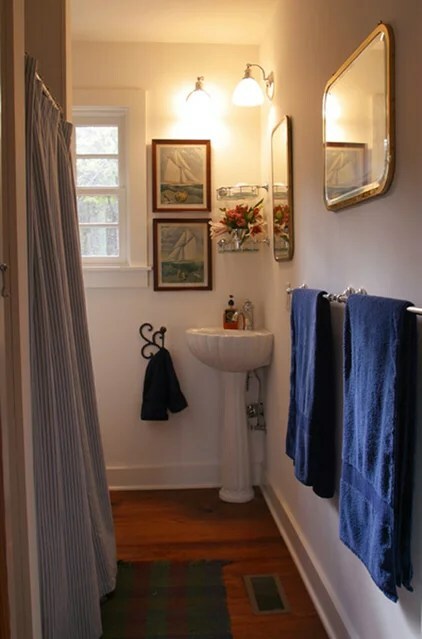 A corner pedestal sink saves space in the full bathroom. … and vice versa. 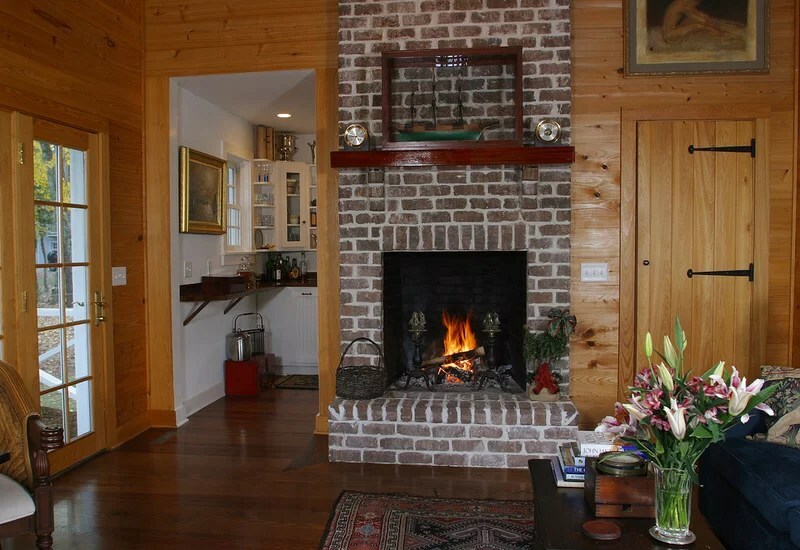 Though not far away, the boathouse serves as a fantastic home away from home. Article Written By: Becky Harris, Houzz Contributor.